Psychology is one of the first classes most students will take in college. Even if they do not take it in college, modern psychology’s worldview perspectives permeate their other classes. The purpose of this homeschool class is twofold. First, students will have a basic knowledge of the brain and nervous system, personality, human development, and more. Second, and most importantly, students will understand psychology’s major theories and schools of thought — at the worldview level. Students will understand that the Christian worldview is the most logical and meaningful framework for understanding the human mind. You’ve worked hard to make sure they are prepared. You know that your child’s first exposure to psychology should come from a Christian perspective, and that it should happen at home — before they go to college. It’s important, and you are the one to do it. Now there is more help from Dr. Tim Rice, author and educator. In this lecture series, Dr. Rice goes beyond the textbook. In each of the lectures, Dr. Rice helps you dig deeper — to understand why the Christian worldview makes sense. After all, it is God’s grandest creation. 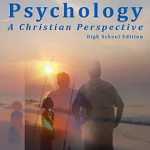 Psychology: A Christian Perspective by Dr. Tim Rice.